During the March 18th Council Meeting, Council approved to keep the Recreation Centre open during the summer months as part of a ‘Pilot Project’. Therefore, the Red Pebbles Cafe will remain running and open to the public during the summer and into the fall. Details on the use of other services of the Centre are still being discussed as Council looks into the logistics. The Township is also currently seeking Parent/Adult Volunteers to organize and run possible youth sports leagues or events. Here is a tentative schedule for the Rec Centre Gymnasium. 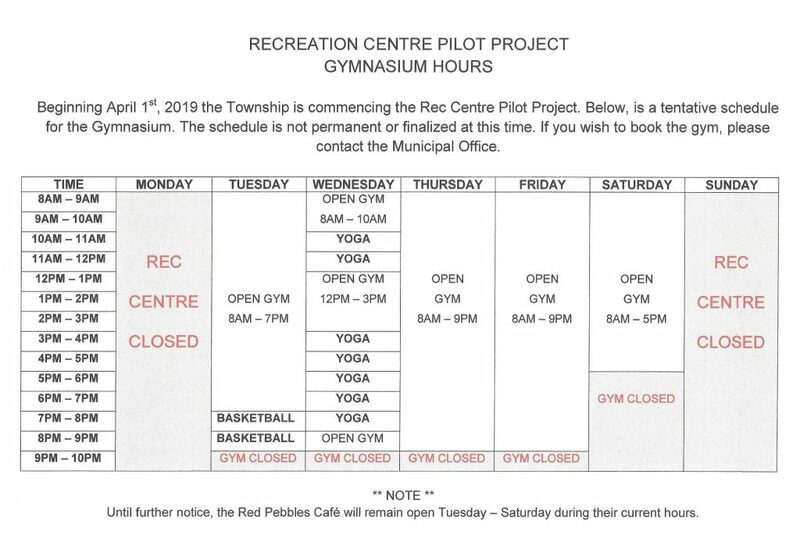 If you wish to book the gym, please contact the Municipal Office.